When fogging, even though not required, the use of protective goggles and respirator / mask is recommended. The 7700 half mask respirators offer the needed protection. The 7700's soft non-allergenic silicone seal provides excellent protection, comfort and fit. The half mask cradle suspension system allows the face-piece to seal evenly on the face without creating pressure points. Its low profile gives workers a wide field of vision and does not interfere with protective eyewear. 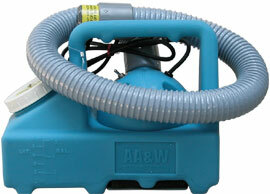 The low inhalation and exhalation resistance of the 7700 Series makes breathing easier. NIOSH approved when used with North cartridges and/or filters. The 75SCP100 replacement cartridge is recommended.